Powerful new update for the GrandMeister Deluxe 40 App for iPad! We’ve released a powerful new update for the remote app for iPad for GrandMeister Deluxe 40, the world’s smartest all-tube guitar amplifier. The app, which lets you store all your favorite guitar sounds and tones via MIDI, has now been refreshed to make preset management simpler and more useful than ever before. You can now easily create new preset lists by dragging and dropping presets from one place to another – perfect for creating specific lists for a specific gig or style. You can also change the order of presets, rename presets, duplicate and share everything with friends. 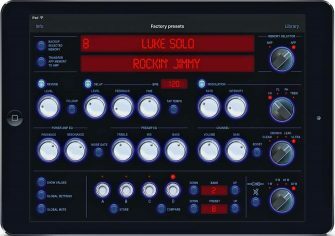 GrandMeister Deluxe 40 Remote for iPad works with any iPad-enabled MIDI interface that offers MIDI Input and MIDI Output. And with the Hughes & Kettner WMI-1, you can even remote control GrandMeister wirelessly!